When a poor farmer falls into the clutches of a dragon, only Seven, his youngest daughter, will save him—by marrying the beast. 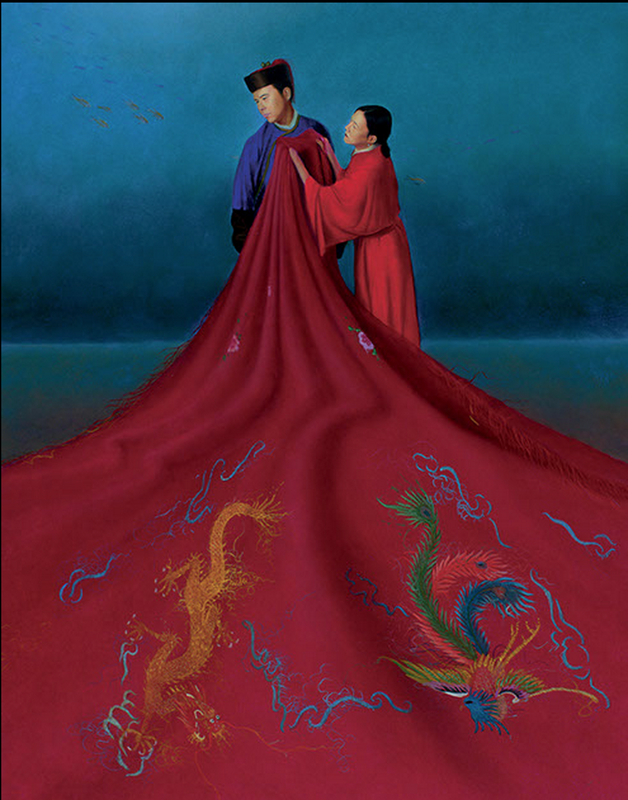 Publishers Weekly praised "Yep's elegant, carefully crafted storytelling" and Mak's "skillfully and radiantly rendered illustrations" in this captivating and luminous Chinese variation of the beauty and the beast tale. The Dragon Prince by Laurence Yep is the Chinese version of Beauty and the Beast, and is so rich in culture. Inside the book the author includes his source notes, explaining that this tale is a Southern Chinese version of the classic. He also thanks Truly Shay for helping him translate several tales for him. Immediately, I felt confident that this book would be of very high quality because of the proof of research. This tale is written in a way that sounds natural when read aloud, and the text is very traditional and stylistically magical. The story includes cultural elements that seem true to the area in which it takes place, including the fact that it’s about a rice farmer and his daughters, a serpent for a beast (that becomes a dragon), the term bride prince is used, and the palace is located in an underwater garden under the ocean’s surface. The story takes an interesting spin, and Seven’s (the Beauty equivalent) sister attempts to drown her and take her place. The prince can tell, though, and searches to find his lost Seven. They live happily ever after. Elegant silk robes, jade cups, and gold plates are illustrated. The illustrations themselves are reminiscent of Chinese style, with bright colors, Chinese architecture and clothing, and a stylized dragon. The prince speaks of the traditional Chinese custom of brides visiting their families after their wedding. Oh my goodness, I love this version of Beauty and the Beast so much. The Chinese culture, colors, and design influences make it not only entertaining, but a rich, educational, vibrant tale that anyone would love. I highly recommend it to anyone who loves China, Beauty and the Beast, beautiful illustrations, and learning about other cultures! Would you say this is more YA or more MG bc I’m definitely intrigued! This also looks really beautiful. I wish there were more versions of fairy tales like this, of novel length. I’m intrigued by Barefoot in the Wind, as I believe it’s Chinese inspired, but there just aren’t enough novel length retellings of other cultures’ versions of stories.